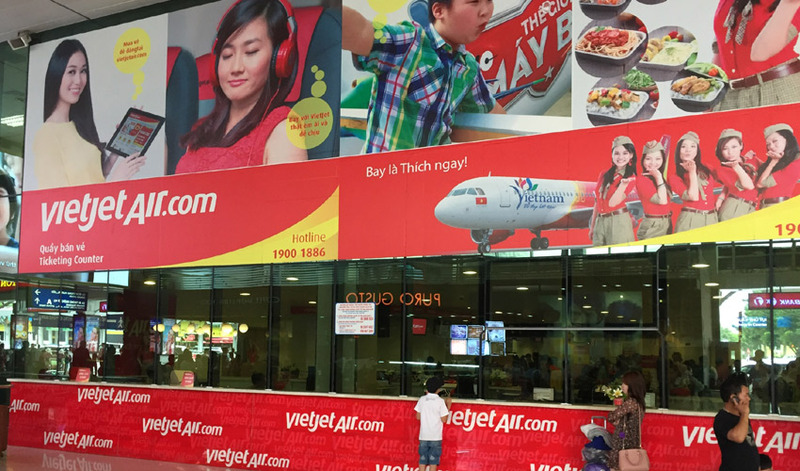 In Ho Chi Minh City, VietJet Air use area 2B of the domestic terminal and they are the only airline that operate from here. With bold and easily recognisable branding finding the necessary check-in is very simple. The area is spilt between passengers with check-in luggage and those without, and despite joining the significantly longer check-in baggage line I was processed in only 5-minutes. In Hanoi the domestic terminal (T1) is spilt between a new and old building and VietJet Air has counters located in both areas. Clear departure screens when entering make it easy to find the necessary counters. Surprisingly, the branding and quality of the check-in area is superior in the older building with larger and more prominent signage. I was early for my flight and able to check-in straight away. All passengers receive assigned seating and for those who check-in online or book a VietJet SkyBoss ticket receive priority assigned seating. Just like in SGN the check-in service was efficient and took less than 5-minutes to complete. There were numerous staff at both airports, acting as both roaming and check-in staff and this was impressive for a Low Cost Carrier. With all passengers having pre-assigned seating there was no mad scramble to board the aircraft as found on some low cost carriers. VietJet have good numbers of staff around the boarding gate to manage the queues and keep order. Most VietJet departures use remote stands and they will pile as many people as possible onto the buses, so be prepared to for an uncomfortable and claustrophobic journey to the aircraft. The boarding procedure allows passengers to use the front and rear aircraft doors making it a slightly quicker and easier to get to your seat. Vietjet has a fleet of Airbus A320/321 aircraft with an average age of less than 3 years, and as such their cabins remain in relatively good condition. Some older aircraft carpets have become quite worn and tatty in areas but a recent order for 100 Boeing 737max aircraft will see a large expansion in their fleet over the next few years. Regular fare tickets allow a single 7kg hand luggage item free of charge. However, the ticket does not come with any checked baggage allowance and charges apply. These charges vary depending on domestic or international routes, weight and if purchased 3-hours before the flight. Passengers can expect to pay between 130,000VND (approx. 6USD) up to 1,150,000VND (approx. 52USD) for a 40KG bag on some international routes. The seat pitch is 29-inches and unsurprisingly, this is noticeably smaller than Vietnam Airlines on their domestic routes. The seat is as basic as it comes with no power, no IFE and is a typical LCC product, however it is fine for these short domestic flights. For passengers who wish to pre-book their seating, and not rely on the random allocation made during check-in, can do so online. Costs vary from 80,000VND (approx. 3.50USD) for an extra legroom / emergency exit row to the most basic 30,000VND (approx. 1.50USD) to simply pre book. The first 5 rows of all aircraft are premium rows, which unlike some LCC do not offer additional leg room, and simply allow quicker deplaning. The availability of the buy on board menu is inconsistent between flights and on occasion not in the seat pocket. The cabin staff are able to provide one when asked but it causes a rushed and confused ordering process. When the menu is available it’s a good product. Clear information and images are available for a good selection of hot meals and instant noodles. There are no sandwiches and few “Western” options for international travellers with spaghetti bolognese being the only choice. Beverage wise there is a reasonable selection of soft drinks as well as a few beers, but unlike most European and US LCCs there are no spirits available. The menu offers prices in USD so for those who haven’t got their heads around the exchange rates this can helpful. Cash VND is the only payment form on domestic routes, however, passengers can use USD and destination currencies on international routes. One significant issue I came across was the lack of available hot meals – on the majority of flights they had run out. Whilst this is expected occasionally (especially if late night) my flights were midday to late afternoon and to have no hot food available was disappointing. On the 1 flight hot meals were available there was only 1 option remaining. When serving hot meals the crew place the food on the tray table with no meal tray or promotional box. 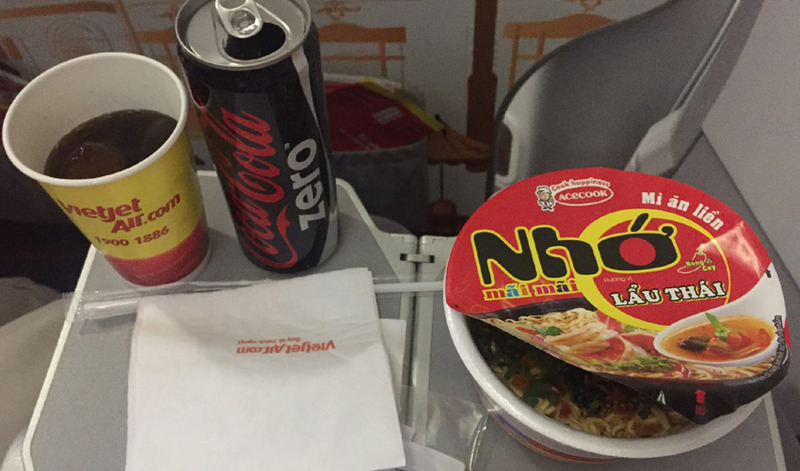 Most passengers ordered instant noodles and these appeared to be a popular product. They were cheap but enjoyable. For those passengers who pre-ordered meals online these are bought out 5-minutes after turning off of the seat belt sign. Passengers are able to order only 2 hot meals prior to flights (spaghetti bolognese and Singapore noodles). The buy-on-board service carts start at the front and rear of aircraft and this meant even on short 1-hour flights all passengers have time to order and eat if they want. I found the cart service to be efficient with the cabin crew showing good knowledge of the products and able to answer any questions. Overall, the food and beverage service was disappointing, primarily due to the lack of hot options. Meanwhile the snack selection was minimal with little emphasis placed on international tastes. The service style was meeting a better standard with a well organised and efficient cart service. A small shopping selection is available on all flights. For those flights longer than 1-hour a cart is used in the cabin. 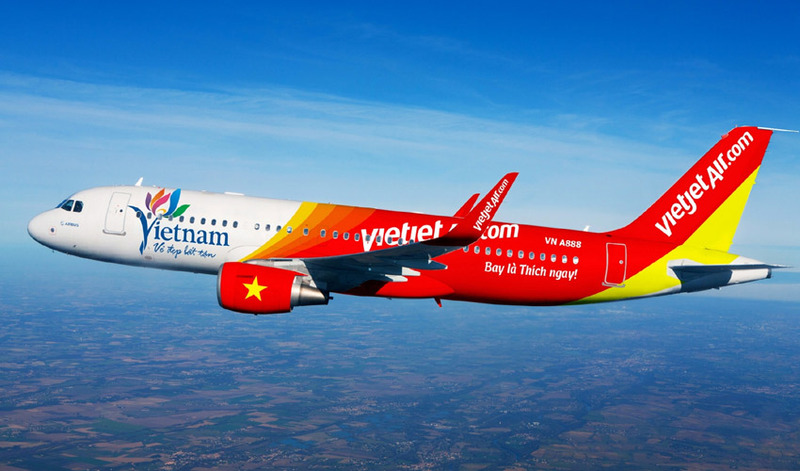 The selection is small compared to other airlines, as well as being heavily geared towards VietJet branded products. Passengers are unable to pre-order products online and all purchases must be made onboard. The staff service was the real surprise of the flights with the crew being friendly, enthusiastic and offering a nice service. They were happy to help all passengers and demonstrated a positive and approachable attitude during the flights. I finished the flights with VietJet Air with a positive outlook on this fast growing airline. 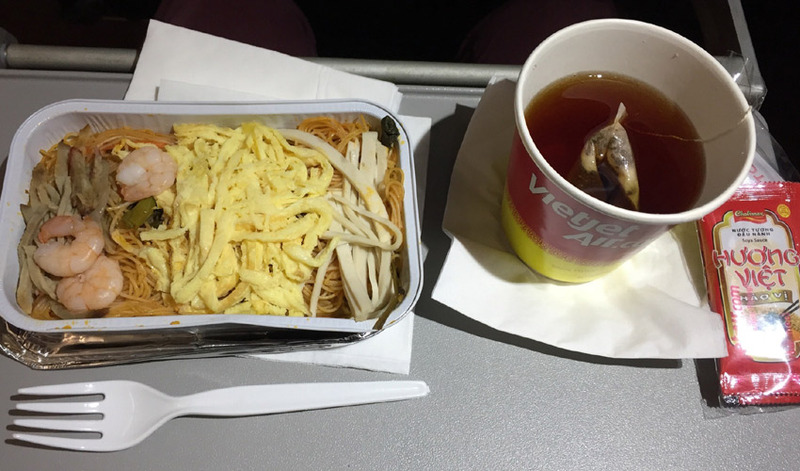 The buy-on-board service was disappointing with a lack of hot food and a small product range compared to other, primarily western low-cost airlines. 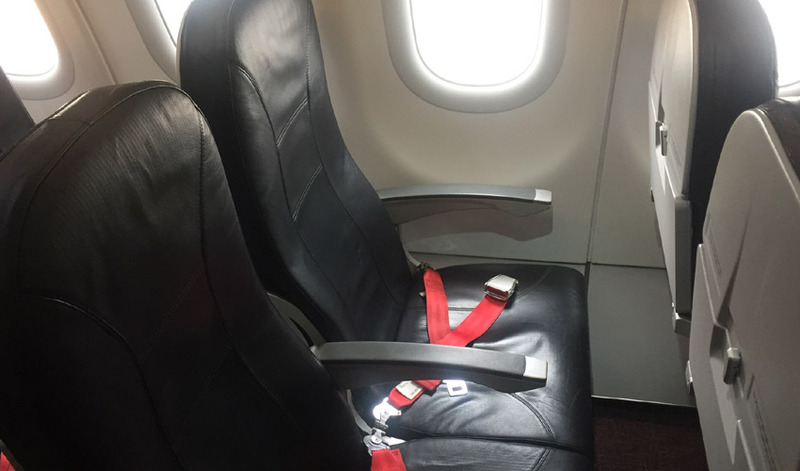 However, the positive attitude of the crew and the ease in which they served passengers took the sting out of a typically small, basic low-cost airline cabin and for these short flight distances this makes a big difference.